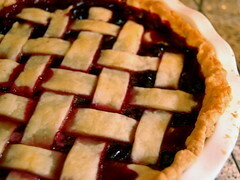 Ages back, I tried my hand at making a grape pie. It was… good but really not great and I purposely didn’t include a recipe for it at the time, because I wasn’t that thrilled with the way it turned out. It was kind of runny and overly sweet. I have since revamped the ingredients and method I tried originally and turned it into this post I wrote for my neighborhood paper, the Manhattan Times. I’m pretty pleased with the results. Wash the grapes and remove the skins. (Just pinch opposite the stem, and the pulp will pop right out.) Set the skins aside for now. Put the pulp into a heavy pan, bring it to a boil, and let it boil until the pulp starts to separate from the seeds. Remove the seeds by putting the mixture through a fine mesh strainer. Pour the hot pulp over the skins and let the mixture sit for 6 hours or overnight. Stir in the sugar and tapioca, set aside for about 20 minutes, then pour the mixture into the bottom pie crust and dot with butter. Put on the top crust. Bake at 400 degrees for 15 minutes. Lower the temperature to 350 degrees and cook 20 minutes more until the crust is browned and the juice begins to bubble up. Serve warm or at room temperature. Reminder: tomorrow at noon, I pick a winner for my first book giveaway! To enter to win, just become a fan of gezellig-girl.com on Facebook. fruit pie! what do I do with this? ← October is… giveaway month! I bought a slice of concord grape pie at the Union Square Market yesterday. really good and yours looks delicious!